I don’t know about you, but sometimes hubby and I know we want steak for dinner, but we have no idea what to do with it. While most great cuts of steak need little more than salt and pepper, sometimes you want to do something more…buuuuuut without a lot of work. Sure you could make a sauce, a pan gravy, or a chutney-style topping, but that requires additional cooking time and makes more of a mess. The easiest thing hubby and I have come up with to season steak is a dry rub. Obviously, we didn’t invent the dry rub, but we haven’t been using it as much as we could. But especially now that we have a grill, the dry rub has started appearing more and more in our kitchen. We’ve received several pre-mixed dry rubs as gifts from friends and family, but you guys know I like to do things from scratch. On Friday, I decided to mix up my own lil dry rub to season a one pound piece of tri tip hubby brought home from Earthfare on Friday. Unfortunately, I didn’t realize how many of my tried and true spices were out of stock at the time. So, I whipped up a really, really basic dry rub that was surprisingly pretty flavorful. I normally prefer to use garlic powder over garlic salt, but we were out! Oops. So, this dry rub uses garlic salt, so additional salt is not added. This recipe will make enough dry rub for a 1 pound piece of steak, but don’t feel obligated to use the entire amount (we had a wee bit we didn’t use). As for cuts of meat, we used tri tip, but this rub would be great on almost any other cut of steak that you would grill (especially flank, filet, or rib eye). 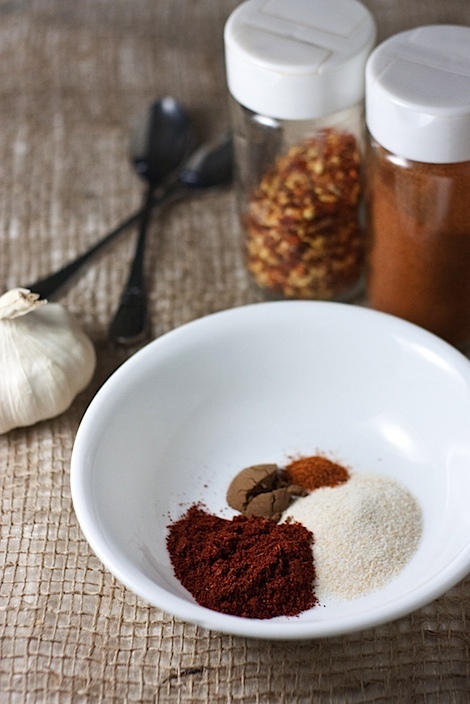 Whisk garlic salt, chili powder, allspice, and cayenne together. Sprinkle rub over your steak and rub in with your fingers. Cook steak as you would normally, though I suggest you grill it. Remember to let your cooked steak rest before cutting into it. 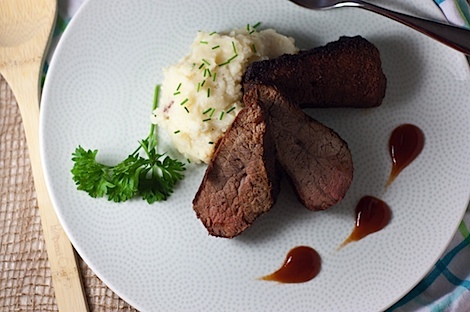 Click here to read more about the meal we used this dry rub to cook. And click here to view the recipe for what looks like mashed potatoes above. Would you believe there is cauliflower in there?! Just curious about the sauce next to the steak. 🙂 It looks an aweful lot like caramel but not sure that goes with steak. Such a waste of a steak to cook it so well done!! Surely that is a matter of opinion. I have many friends who would not touch my medium cooked steak with pink center. In fact, I’ve heard one friend say, “you can burn it” when asked how she wanted it cooked.